'Marvel vs. Capcom: Infinite' Update: Sequel Will not Have Infinite Combos; Real Reason Behind the X-Men's Exclusion in the Game Revealed! New updates for "Marvel vs. Capcom: Infinite" will feature no infinite combos and the real reason for the X-Men's exclusion from the game. It seems that Capcom latest installment of the "MvC" series, "Marvel vs. Capcom: Infinite" will not feature any infinite combos as game producer Peter "Combofiend" Rosas told Kotaku that there is a limit to the amount of combos that players can do in the game. Basically, each consecutive hit in a character's combo reduces how long the enemy character's locked out of action the next time they are hit, steadily cracking open that window for a counterpunch in "Marvel vs. Capcom: Infinite." While players may be able to execute an unbound number of moves all in a short time frame, their opponent is going to knock them right out of their fancy extended execution, and since their hitstun's still fresh, get to have their way with them for a bit. Further more, there is a hard prevention system in "Marvel vs. Capcom: Infinite," making characters automatically kick out of a combo after the 20th grounded hit. Of course, ground-to-air combos are excluded from this, so if players have the mechanical execution, the right character and assists, and the research committed ahead of time, they should still theoretically be able to turn a disadvantage into a deadly weapon for their characters. Meanwhile, it seems that a possible reason for the X-Men not added into "Marvel vs. Capcom: Infinite" has been revealed. Capcom producer Mike Evans told GameSpot that modern Marvel fans might not remember the characters from the X-Men and cited characters like Black Panther, Captain Marvel and Guardians of the Galaxy as memorable characters in the Marvel universe. The absence of the X-Men in "Marvel vs. Capcom: Infinite's" roster has been the source of debate amongst gaming fans as characters like Wolverine, Storm, Magneto etc. have been featured in several crossover series since "X-Men vs. Street Fighter." Evans stated before that the Marvel side will not restricted to just characters from the Marvel Cinematic Universe, leading to the possibility of adding the X-Men and the Fantastic Four into the game. He added that the roster of "Marvel vs. Capcom: Infinite" was already "set in stone" before its public appearance last year. "Marvel vs. Capcom: Infinite" will launch on Sept. 19 for the PS4, Xbox One and PC platforms. 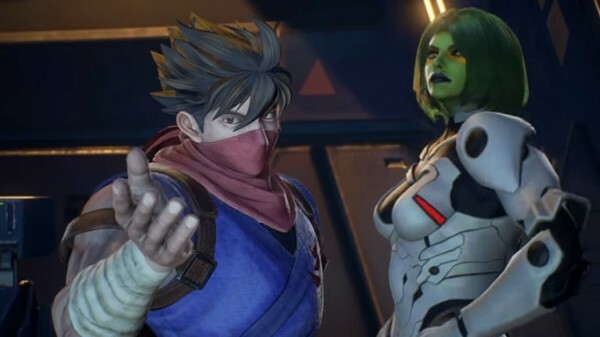 'Marvel vs. Capcom: Infinite' Update: Sequel's New Versus Build Teased at EVO 2017; Game Producer Talks About the Status of the X-Men in the Roster?